This revolutionary design uses no silicone or clips to fasten the polycarbonate panels. 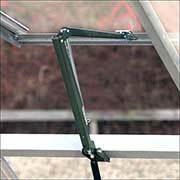 The panels simply insert into the aluminum frame for added structural support and durability. Juliana Basic greenhouses are ideal for people with limited space in the garden. In order to prolong the growing season and to protect plants in the best possible way the Basic is delivered with sheets of 4mm UV stabilized polycarbonate which are assembled without the use of clips. All models are delivered in a strong carton ensuring trouble free handling and transport. 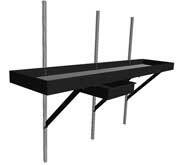 At an additional cost a base is available for the greenhouse, including all the screws and fittings necessary. 4mm twinwall polycarbonate is the most economical glazing materials. It is a practical for a `growing greenhouse as it offers insulation than single pane glass and diffuses harmful sunlight in the summer. It is essentially unbreakable, making it very safe in a family environment. The insulation will prevent the temperature in the greenhouse from changing drastically and results in the best possible growing environment. 2' wide sliding door with rollers.